Well, David's brother Russell came to town last week from Colorado for their dad's heart surgery and his youngest daughter Madelynn was able to come with him. 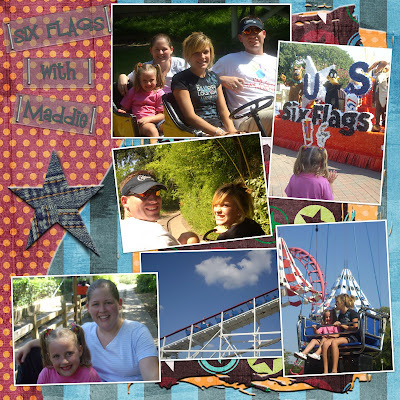 So, instead of Maddie having to spend all day Saturday at the hospital we decided to take her to Six Flags for some fun. Kirstyn was so excited to get to hang out with her and we enjoyed getting to know her better. After all, this was the last time the girls were together! I have been saying that I am going to learn to digital scrapbook so I decided to finally give it a try. I have always enjoyed scrapbooking with real paper and supplies but I have always dreaded the clean up process! I think I am really going to love the scrapbooking without the mess! What do you think? Love the scrapbook pages. What program did you use? Those are great! And I want to go to Six Flags! Looks great! I told you you could do it. 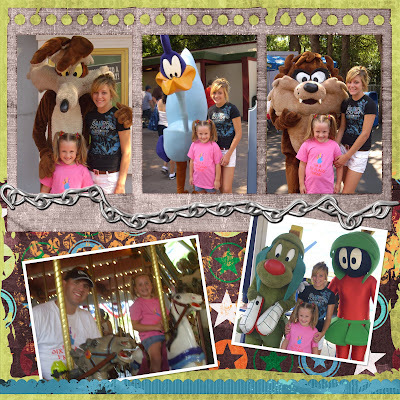 I hate that I am actually going to give up on real scrapbooking but the digital stuff is just soooo awesome! Here I am - fessing up to my stalking! I would go digital on my scrappin - but, I have WAY too much invested in the supplies for the old fashioned way! :) Thanks for letting me stalk you - feel free to do the same!